The weather is lovely but I decided I deserved a play day. I did get to the store and got some plants to put in the wringer washer in the yard but then I finished watching a movie while working on the cathedral window quilt and then moved into the sewing room and started cutting up some scraps. I cut up enough for 6 more of the spool blocks for the group quilt and got those put together along with the accompanying 6 broken dishes blocks. 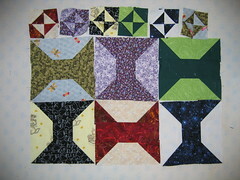 I also cut enough for 12 color blocks for the 4 Seasons Quilt Swap Summer Block Swap. I think there are still openings for this swap. You just need to let Margaret know you are interested and then make up to 20 blocks using her tutorial and send them to her with a self-addressed stamped envelope and you will receive blocks back from the other folks in the group. Pretty simple really! 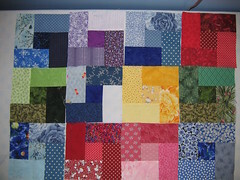 I hope to get another 8 done to send and probably a few more since 20 blocks doesn't make a very big quilt.